IF you guys have heard of Bashar, you may be interested in this. They have been working on this documentary for a while and it is finally available. It's on ITunes and looks pretty interesting, am planning on watching it. 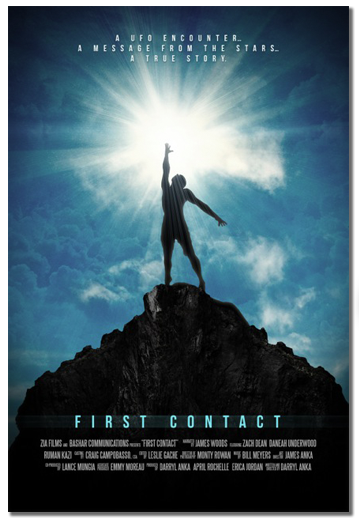 "First Contact,” narrated by Golden Globe-winning actor James Woods, is the true story of Darryl Anka’s close encounter with a UFO, after which he became a trance channel for an extraterrestrial entity named Bashar. The film presents a deeper investigation into the nature of reality, mankind’s place in the cosmos and the potential impact of ET contact on our society. Absolutely amazing! Ive been learning from bashar for about 7 years now and its always been such a delight listening to what he has to say, its hard to put into words but I just feel so uplifted! A lot of interesting information on channeling and many tools that help us live a better life. Channeling has a huge learning curve for those who have never heard of it or think it's taboo. This documentary is an excellent story about an amazing channeler and the story of humanity. It can definitely clear a path into the actual material itself and change your life profoundly if you're looking to do that! Just dropping in a quick line to ask if I send some article ideas your way for a high-quality guest post at your website ? NOTE: In return for the FREE CONTENT/ARTICLE that I will be providing you, I would expect just a favor of a backlink from within the main body of the article. Let me know if I should send you the topic ideas? Hi, you are more than welcome to post and share them here if you wish, and you can include a back link that way. We encourage people to share and post their own articles, ideas, and adventures and if you wish to do so, please feel free Thanks for stopping by!